Milano Centrale railway station: you can take the metro line GREEN MM2 towards “ABBIATEGRASSO” and get off at “S.AMBROGIO”. Once arrived at S. Ambrogio is a 5 minutes' walk to Università Cattolica in via Largo Gemelli, 1. Milano Linate Airport: you can take the “Urban Line Bus 73” or “Urban Line Bus X73” and reach the end of the line “MILAN PIAZZA SAN BABILA M1” stop. From San Babila take the metro line RED M1 towards “RHO-FIERA” or “BISCEGLIE” and get off at “CADORNA”. Once arrived at Cadorna is a ten minutes’ walk to the campus or you can take the metro line GREEN MM2 towards “ABBIATEGRASSO” and get off at “S.AMBROGIO”. Milano Malpensa Airport: you can take the “Malpensa Express Train” which reaches MILANO CADORNA station. Please do note that The MALPENSA EXPRESS travels straight into the airport, stopping at basement level in TERMINAL 1. Once arrived at Milano Cadorna is a ten minutes’ walk to the campus or you can take the metro line GREEN MM2 towards “ABBIATEGRASSO” and get off at “S.AMBROGIO”. Orio al Serio Airport: you can take the “Orio al Serio Shuttle” which reaches MILANO CENTRALE station in around 60 minutes. Once arrived at Milano Centrale you can take the metro line GREEN MM2 towards “ABBIATEGRASSO” and get off at “S.AMBROGIO”. 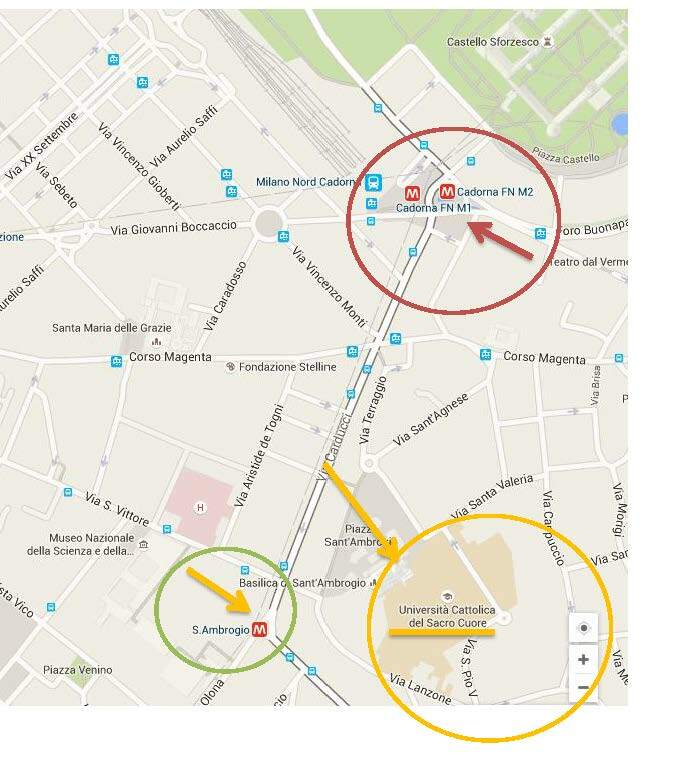 Milano Cadorna: you can take the metro line GREEN MM2 towards “ABBIATEGRASSO” and get off at “S.AMBROGIO”. Once arrived at S. Ambrogio is a 5 minutes ‘walk to Università Cattolica in via Largo Gemelli, 1. For more information on how to reach the Expo Site, please click here.